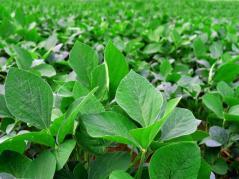 URBANA, Ill. – One barrier to weed control on soybean farms has just been lifted. In early November, the Environmental Protection Agency approved a label allowing use of the herbicide dicamba in dicamba-resistant soybean, although only one commercial product received that label. Many Illinois farmers anticipate this technology will provide a much-needed method to control weeds that are resistant to multiple herbicides, as well as other difficult-to-control species. “Without question, there are instances and scenarios in which dicamba will improve control of certain weed species, but dicamba will not bring back the ‘good ol’ days’ of POST-only weed control programs in soybean. Current expectations of what this technology can accomplish tend to be a bit more optimistic than what the technology actually will be able to deliver,” says University of Illinois weed scientist Aaron Hager. Hager expects the technology will work well in a handful of scenarios. For example, dicamba should be effective for glyphosate-resistant horseweed (i.e., marestail) that does not respond to the traditional burndown tankmix of glyphosate and 2,4-D.
“The new dicamba label allows up to 1 lb dicamba acid-equivalent to be applied prior to planting dicamba-resistant soybean. This can provide better and more consistent control of glyphosate-resistant horseweed compared with 0.5 lb acid-equivalent 2,4-D,” Hager says. It is important to note that although the new label allows soybean to be planted immediately after dicamba application, Hager advises farmers to wait a few days following application before injuring the weeds with the planting operation. Hager also predicts that dicamba will provide good control of tall and ivy-leaf morning glory, as well as common and giant ragweed. “Dicamba certainly can provide better control of herbicide-resistant ragweeds than can glyphosate or ALS inhibitors,” he says. For farmers battling waterhemp, the solution may not be as simple. Most university weed control guides list dicamba as good or very good on waterhemp, but not excellent. One of the most significant limitations is the inability to tankmix dicamba with other herbicides. There is an avenue by which other herbicides can be approved for application with dicamba, but if the current label remains unchanged during the 2017 growing season, applicators will be required to apply dicamba alone. “In other words, farmers will make a separate application of dicamba and another application of other needed herbicides,” Hager says. Additional concerns about the new product relate to yield potential of dicamba-resistant soybean and the possibility of particle drift and volatilization. For more information on these issues, please visit The Bulletin. More information will be shared about dicamba use in dicamba-resistant soybean as the product is rolled out. Hager suggests that dicamba will provide a solution to unique weed management challenges, but notes that not all weed management challenges can be met with dicamba. “Other herbicide-resistant crop technologies, such as Liberty Link and Enlist, also can provide solutions and remain viable options for soybean producers. Proper stewardship of all technologies is essential to prolong their effective utilization,” Hager says.